Food depravation, occupation by fascist overlords, and decades before the invention of PCs and the blog are hardly conducive conditions for research, let alone major breakthroughs. One man thought not. Willem J Kolff, a physician in Kampden hospital in the Netherlands was perturbed by not being able to do anything for people who went into renal failure. He knew, if he could just somehow get rid of the toxins for long enough for their kidney’s to recover he may save lives. In 1943 he built and trailed a dialysis machine(1); — essentially a long tube (30 metres!) of cellophane through which the blood was pumped and what looks like a large washing machine where the urea waste products filtered out of the blood into a rinsing fluid (mainly tap water!). One important innovation was the use of heparin to prevent blood clotting in the needles. Miss S with what would now be called End Stage Renal Failure was the first patient. At just 29 she was dying. We know nothing more about her, but I salute her and her family for their contribution to science and, ultimately, to the saving of lives. Miss S would undergo several dialysis sessions which proved that waste products could be removed artificially. They were successful in preventing further accumulation of waste in her blood for 26 days. Unfortunately, she was terminally ill and died shortly afterwards. As it turned out the first 15 patients all died. The sixteenth, though, was the first to undergo dialysis and to live. She had the acute form of renal failure (now called Acute Kidney Injury, or AKI). AKI is my area of research and dialysis remains, after nearly 70 years, the only therapy available. 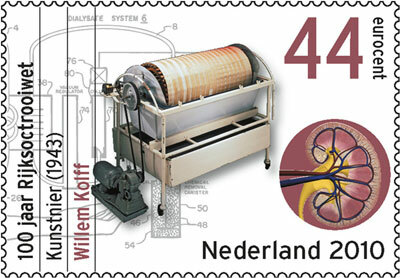 The lessons of the first dialysis machine don’t end at Willem Kolff’s persistence. It is a wonderful example of cross-fertalisation of ideas. The second author on the original paper was ‘H Th J Berk’, director of the Kampden Enamel works. Berk was responsible for the idea of a horizontal ‘washing machine.’ Apparently the local Ford dealer provided the ideal pump — from a Model T! The nursing staff and technicians were indispensable. One, Jan van Noordwijk, at least, found the job kept him out of the hands of the occupiers. 1. Kolff WJ, Berk HT, Welle ter M, van der LEY AJ, van Dijk EC, van Noordwijk J. The artificial kidney: a dialyser with a great area. Acta Medica Scandinavia, vol. 8, p121ff, 1944 .